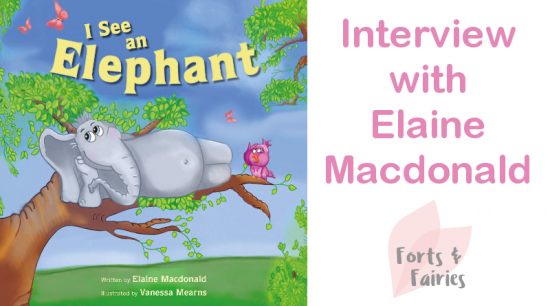 A fun new children’s book by local author Elaine Macdonald has just hit bookshelves around South Africa. I See an Elephant is a wonderful story of an elephant who wants to build a nest in a tree and how he eventually receives help from the birds to help him become a dashing Eli-bird. You can read my review to learn more about this new book. Inspired by the rhyming story and beautiful bright illustrations I wanted to find out more about the author Elaine, who is also well known as a scriptwriter and children’s television presenter, and got in touch for an interview. Find out more about Elaine and where she got the idea for I See an Elephant from, the message of the story, and advice from Elaine for any potential author below. Can you tell us a bit about yourself and how you came to write this wonderful new children’s book? I have been a scriptwriter for what seems like 100 years! Ha ha!!! It was a great way to learn how to write fast. When we were writing Kideo I often had to produce 60 pages of edited script a week, so I developed a method of taking everyday situations and storing them as story ideas. This made sure that I always had new themes and concepts. For example if I saw someone in a situation that was potentially funny I would jot it down as a base for a script idea. I remember one day when a lady had a runaway trolley full of groceries. It was disappearing at great speed through the parking lot. The onlookers were horrified and the poor lady was desperately trying to catch it. I was there with a huge grin on my face and then made a couple of notes. Only afterwards did I think how bad I must have looked! But you get the idea? I always see the funny side of serious issues. What gave you the idea that an elephant may like to be a bird? What was the inspiration behind this I See an Elephant book? The message that you can be whoever you like to be is an important one for our children to learn. How important was it to you that your book included a strong message to children? I got my elephant idea when I heard people moaning about new neighbours who they thought would not fit in. We live in a wonderful rainbow nation full of people with many differences (ages, religious beliefs, colours, genders, interests and cultures). Learning to live together in harmony is where we are at. We all have to give and take a lot more. This is the message of the story. I prefer to write in poetic verse as I believe that it is a fabulous tool to assist children with language development. I also got very familiar with writing in rhyme when writing Kideo scripts, as Mr Chinwag spoke a lot of the time in rap. I got to the stage that I thought in rhyme most of the time! So with my zany way of looking at everyday life and my rhyming habit it was just a hop, step and a jump to writing my elephant book. The book is so beautifully illustrated, with bright and colourful characters that bring your story to life. 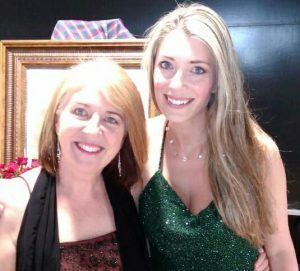 The illustrator Vanessa Mearns is your daughter, tell us more about how the two of you worked together for the book. When you saw the illustrations were the characters how you had imagined them when you wrote the book? Vanessa has always been an exceptional artist. We chatted about the idea of her illustrating for my stories. She jumped in with great enthusiasm. You can see how much fun she had by the lovely images. It is so nice that we can go to book readings and illustration demonstrations together. I read the story and she shows children an easy way of drawing an elephant. We have been booked by book shops and schools and it is so lovely to travel and work together (even with a grandchild or two). Do you have any other ideas for new books that we can look forward to? At the moment we are busy with two new stories. I hope that Penguin likes them!! What advice would you give to anyone wanting to write a book in South Africa? I think my advice to any potential author is to write what you have a passion for. It is important to research your subject and complete your project in the format that the recipient requires. Finally approach outlets suitable for your genre of writing. It is always advisable to read a few books written by authors to get their tips. I have run a couple of workshops on world-building and character creating that were rather successful! I was amazed at the wonderful story-lines and characters that were created in one short day! That was so rewarding to me. Thanks so much to Elaine for taking the time to answer my questions. We can’t wait to hear more about your two new books, and we hope to see you in Durban for a book reading and illustration demonstration soon! I’m giving away three copies of I See an Elephant. Head over to my competition page to get your entry in today! Spread a little cheer, Pan Macmillan’s Christmas books are here!